The schools, parks, playgrounds, swimming pools, hospitals, clinics, and other sites that were created played essential roles in the education, health, and well-being of the population. New Deal funding and labor played a significant role in the Allied victory in World War II (read, for example, about Brooklyn Navy Yard). The New Deal was this nation's finest hour. It wasn't perfect; there were some flaws mainly around racial issues (thanks to the Southern Democrat congressional bloc) and health care (the FDR administration was not able to enact national health care as part of the Social Security Act of 1935 nor on its own in 1939 due to intense conservative opposition). Nevertheless, the New Deal's accomplishments were monumental and an informed 21st-century electorate should know. The New Deal wasn't just employment either. Social Security was a New Deal program that has kept countless millions of elderly people out of poverty and can continue to do so indefinitely if our politicians stop attacking it. Another New Deal Program, the FDIC, protects our bank deposits. The Fair Labor Standards Act set maximum hours and mininum wages. The Wagner Act defended workers' rights to organize and to collective bargaining which resulted in the first-ever prosperous working class in this country. Numerous laws and agencies were created to regulate Wall Street and the banks that resulted in widespread stability and well-being until the new era of deregulation. The great lesson of the last 90 years is that free markets don't work. Left to operate unchecked, they always destroy themselves (quick proof: they were deregulated after the Theodore Roosevelt administration and in the 1920s they collapsed; they were re-regulated in the 1930s and there was no collapse for many decades; then they were increasingly deregulated in the 1980s, 90s, and 2000s and then they collapsed again). Government's job in a capitalist society is to make sure that capitalism works for everybody and not just the super-rich, or to put it another way, to protect capitalism from itself. But since Nixon, and especially since Reagan, government has abrogated that role and a once-prosperous, productive, and stable nation has degenerated a dystopia of obscenely rich elite "winners" and vast masses of struggling, stressed, disenfranchised "losers". There is no more production to speak of, no more prosperity except at the very top, no more economic security, no more good jobs, no more leisure, no more secure retirement, no more peace of mind. People who lived through the postwar era understand that this is not an improvement; it's the kind of disaster that results from government abandoning its responsibility to the population and allowing corporations to export jobs, make off with pensions, write every law, and control every single politician (with a few notable exceptions). The New Deal that worked so well in the 1930s and 40s and the postwar decades has been deliberately wiped from the public consciousness, beginning with the death of Franklin D. Roosevelt on April 12, 1945, to the extent that today, most people have never even heard of it. Or if it was mentioned in school, it was just a phrase with no reality attached to it. What you see on this site is my attempt to fix that. It is the living legacy of a government that put economic justice and the public good before corporate profits. The entire country was mobilized to rebuild itself. And it worked just fine. Ask anybody who lived through the postwar decades. Look around, look at what those millions of workers made in a time when, miraculously, ordinary people were the highest priority of the United States government. Finally, in the mid-to-late 20-teens, we are hearing talk of a Green New Deal, patterned on the economics of FDR's New Deal to bring back prosperity and security to America's working people, and targeted at saving the planet from imminent destruction by rebuilding America's energy infrastructure (and, hopefully, also to rebuild our other crumbling public resources from roads and bridges to public education). This nascent movement is propelled by people who understand the first New Deal and the new dangers posed by unregulated capitalism, far graver than a mere stock-market collapse as in 1929. Voters need to know about the first New Deal to be able to elect a new government that will implement the Green New Deal to save us all, and politicians need to know that this is what the public wants. Significant progress was made in the 2018 elections, but support in both houses of congress and in the White House and Supreme Court is also required. 2020 might be our last chance before it's too late. In most parts of the country — New Mexico, for example — it is much easier to identify New Deal creations than it is in New York City because most New Deal projects in NY were overseen by Parks Commissioner Robert Moses who went to great lengths to conceal the degree to which he accepted federal funds and relief labor to realize his plans (read more about this here and in Robert Caro's The Power Broker). 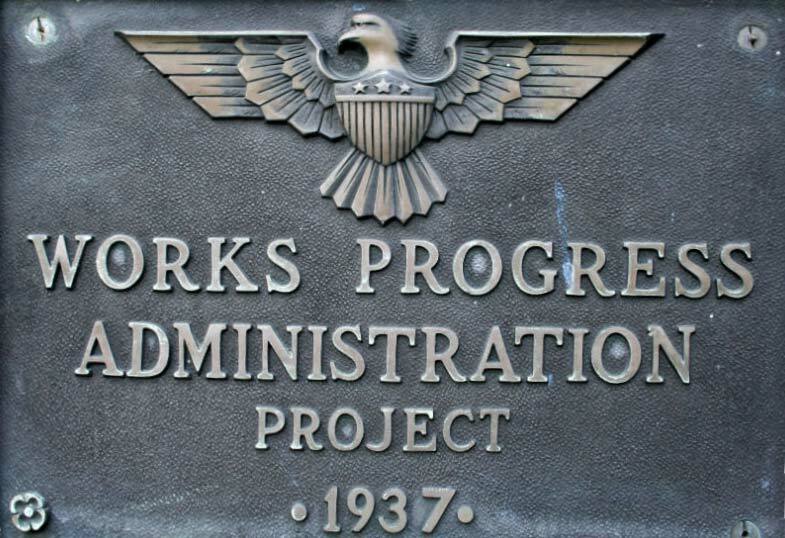 Everywhere else in the country a building or other structure created by a New Deal agency such as the WPA would have an identifying plaque (like the one shown) or cornerstone or inscription, but in New York City there are virtually none*; Moses forbade it. Thus it is possible to be intimately familiar with some New Deal creation like (say) Riverside Park in Manhattan and never know it that it was a massive 4-year 68-million-dollar New Deal project. There are no signs or historical markers, they don't teach it in school, they don't mention it in the media. Unless it occurs to you to wonder, “How did this park get here?” and go digging in Google or some dusty old archive, you'd never know. And the same is true for the Henry Hudson Parkway, the FDR Drive, the Belt Parkway, the Triborough Bridge, ... It's a long, long list that has never been made but the work has started. To see the progress so far, visit the Living New Deal site, for which this site is just a small feeder. Read more about the New Deal in New York City HERE. Although the national New Deal did not begin until 1933, when FDR became president, it had already existed in New York State for some years while he was governor. Thus some New York City projects completed before 1933 — such as the Bronx County Courthouse and the Hunter (now Lehman) College campus — can (or should) be considered New Deal projects. When I toured New Deal sites in New Mexico in December 2018 I saw that New Deal history is not suppressed everywhere to the degree it is in New York City (New Mexico, in particular, exalts its New Deal heritage). I realized that the situation in NYC is due not just to Robert Moses and our free market worshipers, but also to the fact that NYC neighborhoods have no persistent memory because they change every ten or twenty years. In New Mexico families stay put for 500 years; a person can point to a building in their town and say "my granddad built this when he was with the WPA". But in NYC, the families who were in each neighborhood during the New Deal have migrated or been pushed out. For example where I live, the Norwood section of Bronx, was Italian and Jewish during New Deal. By the 1970s it was all Irish. Twenty years later it was Black and Puerto Rican. Today it's one of the most diverse mixes of cultures, languages, races, and religions I've seen anywhere. But these are all newcomers and immigrants, none of them had a granddad who built things here with the WPA. * A few sites that were created through agencies not under Moses' thumb have them: some (not all) schools, firehouses, post offices (click here to see the one example I have seen with my own eyes). During the Depression the New Deal was so busy getting things done that it never got around to leaving behind a definitive and comprehensive list of everything that all of the “alphabet soup” New Deal agencies (WPA, PWA, CWA, NRA, REA, RFC, AAA, CCC, NYA, TVA, FERA...) accomplished. Something that would demonstrate what could be accomplished today if the government had a sense of history. Or decency. In 2005 a project was launched at the University of California at Berkeley to assemble just such a compendium: The Living New Deal. It's not an easy task because modern corporate America has made considerable efforts to erase all memory of the New Deal. In many cases the plaques identifying New Deal projects have been removed or replaced (or in the case of New York City, never existed at all), and many texts fail to mention New Deal funding, design, or labor when discussing the landmarks that were, in fact, created by the New Deal. 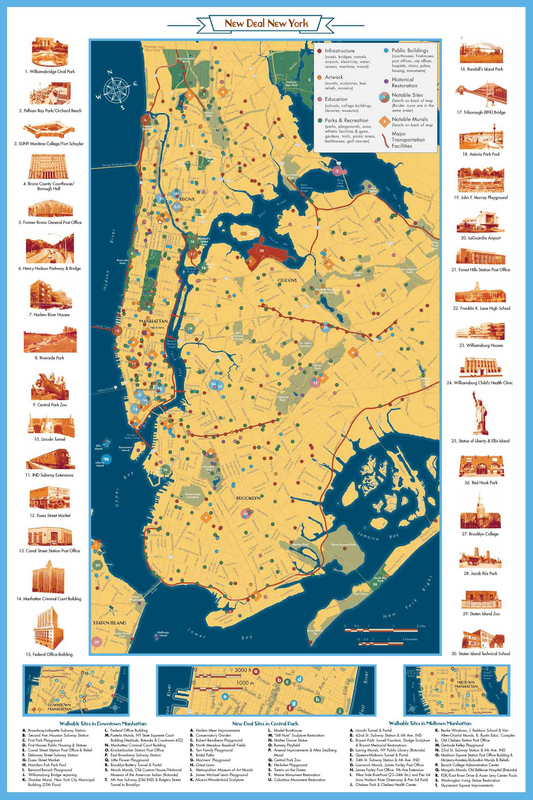 By May 2017, we had compiled enough information on New York City to publish the New York City New Deal Map and Guide. And the digging continues, with many new discoveries since then. Walker, Richard, The New Deal Lives On in the City, The Brooklyn Rail, May 2017. Also available at the Gotham Center for New York City History. Gamso, Nicholas, The New Deal in New York, Revisited (comments on the above), July 14, 2017. Richard Walker Replies, July 14, 2017. Gutman, Marta, New Deal New York: A Living Legacy for Children, Fall 2017 Newsletter, Living New Deal, University of California at Berkeley (30 September 2017). The Life, Times, and Vision of Franklin D. Roosevelt, fdr4freedoms.org. Rosenzweig, Roy, and Elizabeth Blackmar, The Park and the People: A History of Central Park, Cornell University Press (1992), pp.439-463: Robert Moses and the New Deal. A Better New York City, a 1937 WPA film with sound, 8½ minutes.